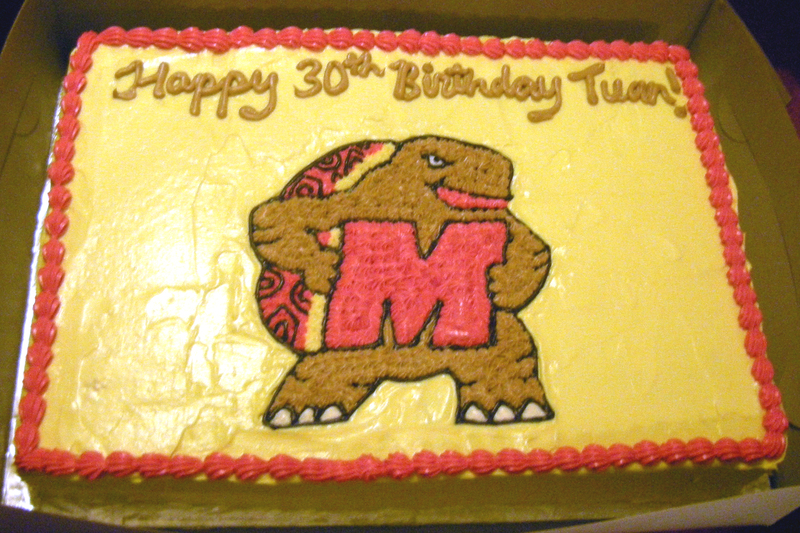 I got an email from a friend with a link to a picture of a MD terrapin cake. She wanted to know if I thought it was something I could do and if so, she’d put me in touch with her friend, Kim, who was planning a birthday party for her fiance. I gave it a good bit of thought before I told them I could do it because I wanted to make sure that I could do it. I had read about tracing designs onto cakes like this and filling them in, but I’d never done it before. Kim asked for a full sheet cake with red velvet cake and cream cheese icing. The first issue I came across was how much red food coloring I would need for a quadruple batch of cake – 24 tablespoons, or about 12 ounces. The normal little bottles are about $2.50 for 1 ounce. Time for plan B. I use gel colors for coloring icings since they are so much more concentrated so I thought I’d give that a try here. I used a red velvet cake recipe that I’ve used a few times before. I made 4 batches – all 9×13’s. I replaced the 6 tablespoons of red liquid color in each batch with a heaping half teaspoon of red gel color. I was concerned about replacing the liquid also, but I wasn’t sure how much to add. I ended up adding 1 tablespoon of water (I probably should have added more). Kim asked for cream cheese icing, so I made up 4 batches and tinted it using Wilton’s Lemon Yellow color. I also made up another double batch, divided it up and tinted it red, black, and brown. For the terrapin design, I had planned to trace the design onto a piece of wax paper and then lay that on top of the cake and trace it with a toothpick. But that would only work with a crusting icing and the cream cheese icing doesn’t crust. Hmm. So I decided to make up a half batch of vanilla buttercream and use that to crumb-coat the top of the cake so that I could draw on it. The tracing of the design onto the cake went pretty well. I found that it was better to initially omit the detail in the drawing – like the mouth, the claws on the toes, and the details on the arms. I drew the outline and then with these two pictures on my laptop behind me, I slowly filled in the color (using open star tips) and added in the details kind of freehand. I am NO artist, so this made me nervous and I was checking the pictures constantly to make sure I wasn’t messing it up! After the terrapin was done, I put the top coat of yellow icing on the top and sides. I couldn’t get as smooth of a finish as I normally would since I had to work around the design in the middle. If I had been using a crusting buttercream, I would have done the final coat of icing first and then put the design on top. But since I was using the cream cheese, I had to improvise. I was really pleased with how this cake turned out – especially because I’d never used this technique before! I heard that the cake was a hit at the party too, so that is always wonderful to hear! This entry was posted on Monday, January 31st, 2011 at 3:16 pm and is filed under American buttercream, Baking, Coloring, Cream cheese, Red Velvet. You can follow any responses to this entry through the RSS 2.0 feed. You can leave a response, or trackback from your own site. That’s so awesome! Love it.